Medicine Hat Mavericks captured the 2018 Western Major League title downing Regina Red Sox 8-2 in the deciding game of the best-of-five final before a capacity crowd of 2,200 fans at Athletic Park. It was the third WMBL title for the Mavericks who also won in 2003 and 2014. Medicine Hat posted the best regular season record (38-9) in winning the Western Division pennant. Regina finished third in the Eastern Division with a 26-21 mark. 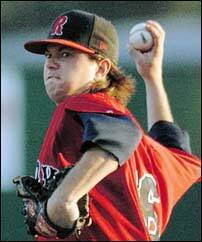 Red Sox advanced to the final defeating Swift Current, the defending champions, and Weyburn Beavers. Corey Wheaton (left) of the Weyburn Beavers was named the leagues Most Valuable Player. The product of Scottsdale, Arizona, had an outstanding summer batting .372 in 45 games. The outfielder led the circuit with 30 stolen bases and produced 11 doubles, three home runs and 15 runs batted in. Wheaton came to Weyburn from the University of Mobile. Kaleb Warden (right) Lethbridge Bulls infielder was selected as the Rookie of the Year. Warden, who attends the University of Arkansas at Monticello, had a highly impressive first season in the WMBL. He registered a .369 average with eight doubles and seven home runs along with 38 runs batted in. Catcher Jaret Semeniuk, a native of Edmonton, Alberta, showed poise both with his glove and bat in being selected as the top Canadian Rookie. Semeniuk, a freshman with the Prairie Baseball Academy, played in 30 games with the Lethbridge Bulls compiling a .371 average with seven doubles. Riley MacDonald (right), catcher of the Brooks Bombers, was honoured with an Outstanding Achievement Award after setting a single season home run record with 20 circuit clouts in just 138 at bats. MacDonald topped the previous mark of 18 by Jesse Sawyer of Lethbridge in 2011. The slugger is a product of North Vancouver baseball and suited up for the Waldorf University Warriors this spring before lining up with Brooks. Right-handed reliever Craig Smith closer of the Okotoks Dawgs was an Honourable Mention after setting a Western Major Baseball League record for saves. Smith registered 15 saves in the Dawgs' 35 wins this summer. Andrew Murphy of the Mavericks was named Coach of the Year. The Okotoks Dawgs led the WMBL with seven first team all-star selections. Colton Wright of Medicine Hat claimed the first team catching slot with an infield of Warden af first, Nolan Rattai, Medicine Hat, at second, Nate DeChaine, Okotoks, at the hot corner, and Carson Johnson of Medicine Hat at shortstop. Collin Ridout and William Hollis of Okotoks joined Wheaton in the all-star outfield. Three starting pitchers were selected - Cody Ebert,Okotoks, Ryan Johnson, Weyburn, and Owen Steele of Yorkton. Dustin Schorle of Okotoks won a slot in the bullpen and Smith, with his record-setting 15 saves, is the closer. In June, the league announced it would be changing the name of the circuit to the Western Canada Baseball League. Swift Current captured its second straight WMBL title, again (as in 2016) downing Edmonton Prospects in the final. The 57s won the series three games to two after sweeping last year. Swift Current lost the first two games of the Eastern final to Weyburn before charging back to win three in a row for a spot in the finals where they fell behind two games to one before winning the last two to claim the championship. Okotoks Dawgs captured the pennant with a record of 35-13 during the regular season. They led the loop with five players selected to the First Team All-Stars. Kody Funderburk of the Dawgs was named the Most Valuable Player for 2017. The native of Queen Creek, Arizona, capped a spectacular season playing in 45 games with a .339 batting average and a league-leading 15 home runs. Funderburk also starred on the mound making nine appearances without allowing a run. He fanned 11 and gained credit for one save. Blake Adams (far right) of Swift Current was named Rookie of the Year. The outfielder from Tarleton State University in Texas hit .360 with eight doubles and 12 four baggers. He knocked in 54 runs and racked up 18 stolen bases. Matt Lloyd (right), the Okotoks product, was selected as the Canadian Rookie. The All-Star second sacker who attends Indiana University had a 24-game hitting streak, finishing with a .402 average, eight home runs and 38 RBI. For the second straight year a team went undefeated in the league playoffs en route to the WMBL championship. This time it was the Swift Current Indians winning all nine post-season games to duplicate the feat of the Lethbridge Bulls in 2015. Reliever Ryan Pope was named finals MVP after gaining three saves in three consecutive days, hurling eight frames in the finals. Over the nine playoff encounters, Pope, a 5’8” right-hander out of Sterling College, picked up seven saves in fashioning a 1.12 ERA in 16 innings, fanning 19. Swift Current shortstop Alec Humphreys (left) was selected as the league's MVP for the regular season and teammate Bodie Cooper, a catcher, was chosen as Rookie of the Year. Humphreys sizzled at the plate, with a .393 average with 14 doubles, a triple and five homers in 48 games. He knocked in 30 runs. Outfielder Cory Scammell (right) of Edmonton, a former pro in the Seattle Mariners' farm system, was the 2016 batting champion. Right-hander Kody Rock (left) of Yorkton Cardinals, a Canora, Saskatchwan native. was named the top pitcher after compiling a 1.91 ERA in 61 innings with 59 strikeouts. The league added two new teams for the 2016 season, the Brooks, Alberta Bombers, and the Fort McMurray, Alberta, Giants bring to 12 the number of teams in the loop with six in each of the Eastern and Western divisions. The Lethbridge Bulls captured their first league title with a remarkable playoff run winning all nine post-season games downing Regina Red Sox in the final. Dylan Dyson of the Bulls was named the playoff MVP hitting .474 with three homers and 13 runs batted in. Bulls had the league's best record during the regular season winning 34 of 38 starts. Outfielder Brandon Bufton (left) of the Bulls was named the league's MVP after hitting .359. Jose Rojas (right), a California college star playing with the Swift Current Indians was the batting champion, with a .366 average, and was named Rookie of the Year. The Pitcher of the Year was Trevor Swaney (far left) a right-handed pitcher from Illinois (Wright State University) of the Okotoks Dawgs who finished with a 7-1 record and league-leading 1.69 ERA. Swaney's teammate Dylan Nelson had the best won-lost mark winning seven straight decisions without a loss. J.J. Santa-Cruz of Moose Jaw Miller Express (near left) topped the circuit in strikeouts as the lefty fanned 79 in 62 2/3s innings of work. Medicine Hat Mavericks captured the 2014 WMBL title downing Swift Current 6-3 to win the final series three games to one. Mavericks had finished the regular season in second place in the Western Division, six games back of Lethbridge, and edged out Okotoks in the semi-finals. Swift Current won a spot in the final defeating Regina Red Sox in their playoff series. Moose Jaw, who finished second in the Central Division, had the league's top hitters and leading hurler. Aidan Stinnett (far left) the Moose Jaw third sacker led the loop in hitting with a .393 average, barely edging outfield teammate Miles Hunter (near left) who finished at .391. Eros Modena of Swift Current, who was fourth in the batting race with his .370 mark, knocked in the most runs, 46. Terry McNabb (right) of Moose Jaw had the most pitching wins, with an 8-1 record, and led in strikeouts with 73. 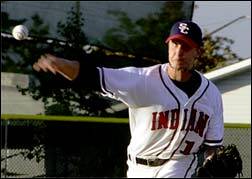 Scott Cone of Lethbridge had the best ERA, 2.08 to go along with a 5-1 record. Melville Millionaires are the 2013 champions of the Western Major Baseball League defeating the Medicine Hat Mavericks, the best team during the regular season, three games to one in the final series. Michael Corso (left) of the Moose Jaw Miller Express was selected as the league's Most Valuable Player. The native of Vancleave, Mississippi, led the circuit with 11 home runs and 46 runs batted in and was the runner-up in batting average, finishing at .388, six points back of Thomas Rodrigues (right) of Okotoks. Alex Bos of Medicine Hat with a perfect 8-0 won-lost record was tops in that category. Homero Ortiz of Melville was right behind with a 7-0 mark and an ERA of 1.50, second to Billy Martin the Medicine Hat right-hander, who was 4-0, 1.14. Swift Current's Anthony Armanino, 4-0, 2.25, was tops in strikeouts with 60 in 40 innings of work. Grant Silva of the Mavericks had the most thefts, 37. Regina Red Sox dumped Medicine Hat 7-3 Wednesday (August 15) to win their second consecutive WMBL title. Sox took the best-of-five final series in four games. Randy Ramirez led the offense with a two-run homer and Chris Untereiner had a solo shot. Ryne Drummonds went seven innings for the win. Regina, under first-year head coach Justin Eiswirth had the best record during the regular season finishing with a mark of 34-12. The MVP award was shared in 2012 as selectors choose both Ridge Gonsoulin (Lethbridge Bulls) (far left) and Aaron Dunsmore (Swift Current Indians) (left). Gonsoulin, from Louisiana State University in Shreveport, had a record-setting 25-game hitting streak. Dunsmore, a Canadian from Spruce Grove, Alberta, was a leading hitter for the University of Dayton, Ohio and finished the WCBL season with a .403 average while belting 9 homers and driving in 42 runs. Josh Young of Regina (above right) won the batting crown with a .416 mark, edging Gonsoulin, who registered a .413 average. Daniel Jones (right) of the Regina Red Sox was named the top pitcher after a sensational season in which he set a record for wins (9) and also topped the circuit in ERA (1.34) and strikeouts (70). Jones, a right-hander from Daytona Beach, Florida, came to the Sox from Brewton-Parker College in Georgia. where he was an All-Star hurler. In the spring of 2012, Jones went 7-4, 2.35 on the hill for the NAIA (National Association of Intercollegiate Athletics) squad while compiling a .316 batting average in 48 games as a hitter. Regina Red Sox captured their first WMBL title in 2011 downing the Okotoks Dawgs three games to one in the final series. During the regular season Regina, the Eastern Division champs, had the best winning percentage with a 32-10 won-lost record. Okotoks, the Western Division champs, and Medicine Hat, the Western runners-up, tied for the most wins, each with 34. The teams in each division finished in the same order as in 2010. Jesse Sawyer (left) of the Lethbridge Bulls was selected as the league's Most Valuable Player. Sawyer led the loop with 18 home runs and 50 RBI. The homers set a single-season record for the WMBL. The Calgary native, who attended South Dakota State University, finished with a .351 batting average and scored 38 runs. For a slugger, Sawyer showed outstanding plate discipline with 37 walks and 39 strike outs. He compiled a .500 on base percentage and .773 slugging percentage. In the playoffs, he hit .400. Bryan Abrey (above right), of the Medicine Hat Mavericks, captured the batting crown finishing with a .423 average. Abrey, from Vancouver and attending Lewis-Clark College, had been selected as the 2010 Outstanding Canadian in the league. Reliever Chad Jones (right) of Swift Current Indians was named Top Pitcher. The right-hander compiled a 6-2 record with an ERA of 1.06 in 22 games. The Swift Current Indians are the new champions of the WMBL! Swift Current captured the 2010 title August 14th with a 7-2 win over Regina, sweeping the best-of-three series. They won the opener 7-1. Rain forced the league to switch from a best-of-five final to a best-of-three series. 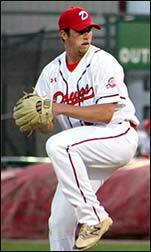 During the regular season, the defending champion Okotoks Dawgs again had the best record, with 31 victories. Regina first sacker Mitch MacDonald (left) won the Triple Crown leading the league in batting average, .476, home runs, 8, and runs batted in, 48. McDonald, a Regina product, was also named the league's Most Valuable Player. The first baseman had experience in the Florida Marlins system after signing with the club after a record-breaking, all-star, college season at Monterey Peninsula College in California in 2007. Adam Reynolds (right) of Lethbridge was named the top pitcher in leading the league in wins (7) and ERA (1.26). The Okotoks Dawgs finished with the best overall record in the regular 2009 season and went on to capture their third straight WMBL championship. Okotoks and Melville Millionaires had each won a game in the best-of-five final when rain and the need for players to return to their colleges wiped out the rest of the series. The league declared the two clubs as co-champions. But, Melville was later found to have used an ineligible players and Melville was disqualified. Nik Gumeson (left) of Swift Current was selected as the leagues Most Valuable Player and Rookie of the Year. Gumeson, from Utah University, batted .312 and led the league in slugging percentage (.675), triples (5) and tied for the lead with 11 home runs. He had 42 runs batted in and slammed 14 doubles.